I've witnessed many frights in my life. I’ve had times where I thought my skin would be taken over by goosebumps, or where my spine would become frostbitten from an intense chill running down it. I’ve battled demons and danced with ghosts. But, no amount of terror could ever prepare me for this. Yes, that is a mannequin displaying day-glow bra and matching boyshorts ON TOP of a black tank and black tights. This horrible sight was the only image that played in my mind for several days. And still it haunts me. Why would someone want to create such a hideous monster? What kind of vile human decides to wreak such havoc? My phone wasn’t able to capture the best picture because of the lighting… and the fact that I could barely contain my laughter enough to keep my hand straight didn’t help much either. 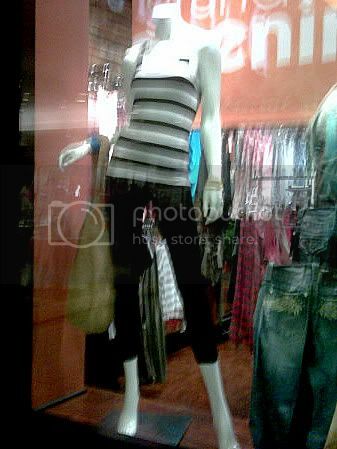 But, this dummy displays in all its shoe-less glory a B&W striped, ribbed tank top and some black leggings. It is accessorized with a light brown wicker purse and such sort of silicone watch. Can you say horrifyingly trashy! Mannequins are supposed to draw customers into your store, and help suggest trendy items to your clients. They are not meant to have people running away in fear! The horror! Enter at your own risk! Move over ghouls and goblins. You have new competition for scariest sight in this town. I hope I didn't give you nightmares… Muwahaha!